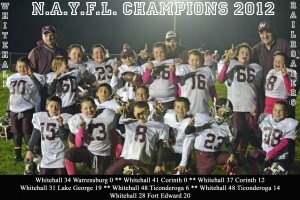 The Whitehall junior tackle football team recently completed a perfect season with a come-from-behind 28-20 win over visiting Fort Edward. “When we started the season with a 34-0 win in Warrensburgh without even allowing a first down I knew we were in for an exciting season,” said coach Ray Lyman. “I attribute the wins to hard work at practice; we ran a lot of complicated plays that they learned well and executed even better. Even with only 16 signing up we still had the perfect mix: big fast line and a quick and tough backfield with a returning second year QB. Our defense was the same with a dominating front four, with textbook tackling on the outsides and a lot of speed in the secondary. The Fort Edward game was our biggest test of the season with the loss of our quarterback and defensive end two days before the game but we made some adjustments and the kids picked it up quick and fought hard to come back from a 14-0 deficit in the first quarter. You couldn’t ask for a better group; 12 out of the 16 move up together next year and if they all return I expect we will have another great year. They did a great job.